Aside from “stock” items such as flippers and solenoids it has been completely manufactured from scratch. Most of the artwork is from his movies and has been assembled in stylized montage form as is typical for a pinball machine. It is controlled by a single Parallax Propeller CPU which runs PCM audio music & voice clips as well as handling game logic, I/O and driving the custom LED display. I did the mechanical design, layout, construction & programming all myself, except for the sound player libraries that I got off the Parallax Object exchange website. I’ve prepared all sorts of stuff for people to check out, so please check out the links below. Also, I did consider creating a “Virtual Pinball” version of this machine but ultimately didn’t have the time. If anyone is well versed in that tool and wants to take a crack at it, let me know, I can supply with you specifications. A four part article that describes the making of the machine in great detail. Includes photos of the guts, making of video links and source code. Contains lots of photos of the machine and its various parts (finished condition). See the machine in action, and check out descriptions / demos of the specific modes and toys. 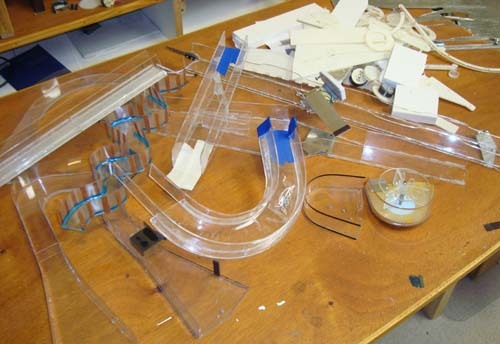 A downloadable video demonstrating the process from start to finish. 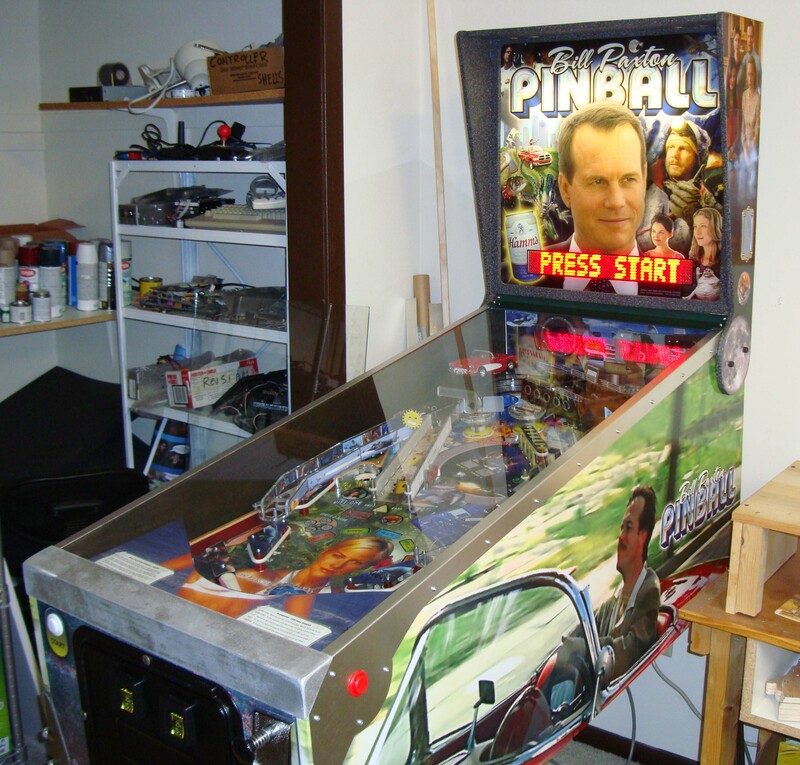 Notice: Bill Paxton Pinball is a personal project and therefore is not for sale or duplication. All music / images / audio used on it are owned by their respective copyright holders. 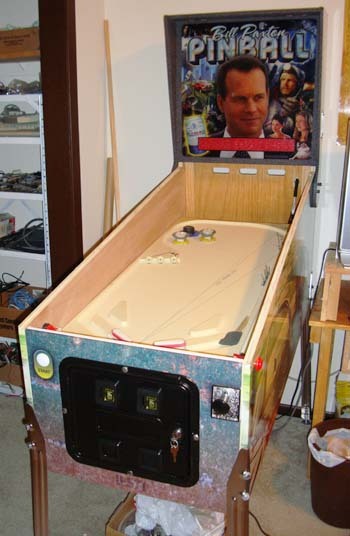 Wow it’s been a couple months since the last official Bill Paxton Pinball update! The playfield is complete, the code is less buggy and it will definitely be done in time for the 2010 Midwest Gaming Classic. For a sneak peek at the vector drawing of the final board, hit the rest of the story after the bump. We’ll see you soon! The finest in American engineering and pinball amusements. Up to 4 players per game – Modes are shared between players so it’s a race to see who can activate the big point bonus first. High score save – Saved in the unused top half of EEPROM so it’s there forever, unless specifically wiped or of course beaten. Animation – Using a separate program from the main kernel, Windows bitmaps are pre-loaded off SD onto the EEPROM for faster access during play. Non-buggy sound playback – Sounds can interrupt each other without chance of lockup, thanks to a system of flags that properly closes any playing file before opening a new one. In some sad news, there will come a point where updates on BPP come to a stop as the unit nears completion and I’ll want to keep its final look a secret until the reveal. This will probably happen when I put the main artwork on the playfield. However the goal still is to have this done in time for the Midwest Gaming Classic 2010 in Milwaukee Wisconsin, so it’s playable at our booth. Again, this is being done as a personal “fun” project and is not for resale, however if you’d like your own custom pinball made I would be willing to discuss ideas. I may create a “kit” of the circuitry when it’s all said and done. More info and video after the break! 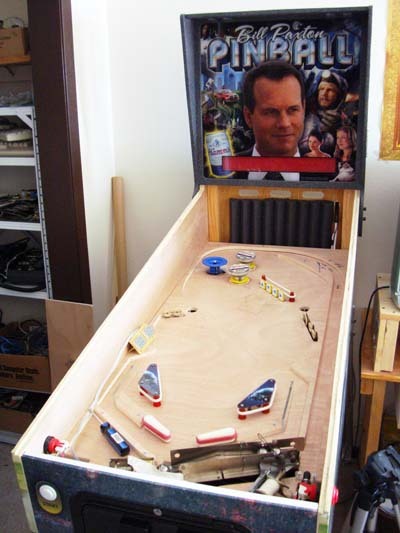 Work continues on Bill Paxton Pinball – the longest suffering Ben Heckendorn project of all time. The unit now has legs, a functioning input/output controller, tilt sensor, power supplies, fuses, front coin door panel, plunger assembly, start button, sound amplifier and some temporary targets.